It's finally here. The first trailer (as long as you don't count "Iron Man," "Iron Man 2," "The Incredible Hulk," "Thor," or "Captain America: The First Avenger") for Joss Whedon's massive, mega, Marvel superhero crossover event "The Avengers." That's right. The gang is all here: Captain America (Chris Evans), Thor (Chris Hemsworth), Iron Man (Robert Downey, Jr.), the Hulk (Mark Ruffalo), Black Widow (Scarlett Johansson), Nick Fury (Samuel L. Jackson), Hawkeye (Jeremy Renner), and Agent Coulson (Clark Gregg). So what do we actually see in the trailer? Let's take a look. Warning: Potential spoilers, definite geekiness ahead. New York, New York. After taking us to Los Angeles, Rio, New Mexico, and war-torn Europe, Marvel's finest finally come home to the city where they were all born. This shot practically screams for a Stan Lee, "Listen up, True Believers!" voice-over. Things shift from serene to pear-shaped pretty quickly, though. Is that "Aussie Bum" banner in the background a slight wink at the hunky - and likely shirtless - Chris Hemsworth? We like to think so. BOOM! We don't have high hopes that Officer O'Donuts there makes it to the sequel. The guy on the far left is S.H.I.E.L.D. Agent Coulson - the glue that ties together all the individual movies (his cameos in "Iron Man" and "Thor" are memorable) and the man in charge of shepherding the superpowered do-gooders into, well, this movie. But who's in the copter? Aw, yeah. The guy behind the guy behind the guys: Nick Fury. The one-eyed superspy gets a suitably dramatic entrance. Bruce Banner (newcomer Ruffalo, the third man to play the Hulk host body after Eric Bana and Edward Norton) and Steve "Captain America" Rogers follow Black Widow into the S.H.I.E.L.D. stronghold. Eyes up here, Cap. Cap is rewarded with a brand new costume - one that is more streamlined and comic book-y than the dumpy duds he sported during WWII. Banner, meanwhile, appears to have been seeking spiritual guidance in order to contain his inner beast. We're betting it doesn't last long. We're also secretly hoping this is just a set-up for the whole "Hulk and his harem in Tibet" storyline from the Ultimate comics. Rogers works out his "I've been frozen since the 1940s and everyone I know is dead" frustrations out in the S.H.I.E.L.D. gym. This shot was featured in the end credits teaser at the conclusion of "Thor." "THOR! <crash> AAA-AAAAAAH! HE'LL SAVE EVERY ONE OF US!" A better shot of the deadly (and apparently dangerously flatulent) Black Widow. Johansson's slick super agent made an impressive debut in "Iron Man 2," and will play a major role in the earth-threatening adventure this time around. ...As will Renner's Hawkeye, previously featured in an extremely brief cameo in "Thor." Like Widow, he isn't super-powered, just very, very skilled. He's got a little chip on his shoulder around his new gamma-irradiated and Norse godly co-workers. The man of the hour. Star of not one, but two, blockbuster solo outings, it's Tony "Iron Man" Stark. Note the Black Sabbath T-shirt. Wonder if they have a song that might be appropriate for Tony's iPod? Geek icon Whedon wasn't about to skimp on one of the most tension-filled working relationships in comics - the one between straight-shooting Boy Scout Captain America and morally-casual egotist Iron Man. 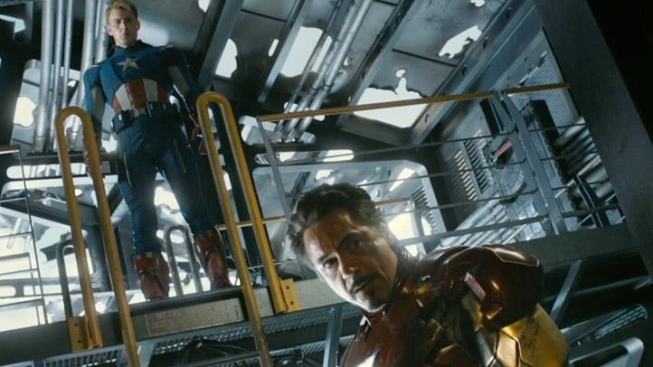 Evans and Downey jawing at each other might even be better than the action scenes. Only one of them has matching carpet. Not saying which one. After a few cameos spent standing around the shadows and pontificating, we will finally see Fury in action. And he does not mess around. Or perhaps they are fighting...each other? Thor vs. Cap - Who ya got? Banner and Stark chat. The purple shirt is a nice touch, given the Hulk's well-known sartorial choices. The money shot. Our first look at the all-new Hulk. 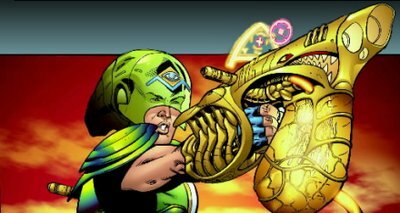 When your job is too big for a super soldier, a genius in a robot suit, and a Norse god - who ya gonna call? "The Avengers" splashes down May 4, 2012.